When it comes to choosing the right formula for your baby, there are a lot of options. To get the right formula is super important for your child to be able to grow up healthy and strong. Plum Organics infant formula is supposed to be a great choice for your child. Every ingredient meets the highest standard of organic certification possible. Plum Organics infant formula is designed to be the healthiest bottle of formula for your baby while also being extremely easy on their stomach. However, this product is a bit more expensive than even the other organic baby formulas on the market. That may be one of the contributors to its current 3.6-star rating on Amazon. Let’s look at the rest of the factors in Plum Organics infant formula and see if it deserves more attention than that rating makes it seem like it deserves. Infant formulas that created with a modified cow’s milk are typically the best kind of formula to give infants. They are the most recommended, and infants tend to be able to be able to stomach and process them more effectively than the alternatives. Plum Organics infant formula is derived from completely organic cows milk. Because the cows have been treated so well, their milk is more natural and healthy. Plum Organics infant formula seems to be a healthy formula, but there are also reports that it tastes much better than some other formulas. Many infants seem to respond very well to this formula. However, there are a lot of formulas that infants respond well too. Does that make this price point really worth it? Well if you want to give your child one-hundred percent organic, this just might be your best option. Plum Organics infant formula is full of great ingredients that are going to help your baby be healthy and strong. The ingredients in any formula are some of the most important things you can look into when considering a formula. The reason for this is that each formula contains different ingredients. The basics may be the same, but they are mixing in a lot of different vitamins and minerals. Infants are pretty delicate, and they can be sensitive to certain ingredients. If a child has a slight allergy to one of the ingredients, there is a chance that a rash could form. Plum Organics infant formula has a lot of great, organic, ingredients, but that doesn’t mean that your child will not be reactive to one of them. As I have said, cow milk formulas are the easiest for babies to adjust to. Taking out the fats that are natural to the milk allows Plum Organics infant formula to have more freedom in the fats that they do provide the child. That is a good reason to use non-fat milk. The downside of using milk is that there is lactose in milk, and if your child is lactose intolerant, using a milk based product can cause your child to get really sick. However, lactose is also in breast milk, so this makes for a perfect mixed approach formula. This is the monounsaturated and polyunsaturated fat that is added to Plum Organics infant formula. Fats are necessary for the development of the brain and other organs for children. Fats also help the development of a healthy nervous system in infants. This type of fat is low in saturated fats and has no trans fat. Now soy is a controversial ingredient. There are a lot of possible health benefits, but there are a lot of possible negative benefits too. There are a lot of studies that say soy ingredients are not good for anyone under the age of 18, but there are also studies that say there is no evidence of long-term negative effects of soy either. It is hard to say. However, the oil is contained in Plum Organics infant formula. Plum Organics infant formula contains a good amount of healthy vitamins and minerals for your infant. These are necessary for the growth and development of children, especially in their early years. In these vitamins are some Omega 3 fatty acids to help your child’s brain develop and grow. If fish isn’t part of a mother’s regular diet, then a child might not be getting the Omega 3’s they may need to have this necessary acid in their diet. Breast milk is the best option for babies. However, we understand that breast milk may not always be the best choice for parents. Making the decision to have your child drink formula rather than breast milk is your choice, and there are a lot of really good options to give your child. Most doctors will recommend a modified, cow-milk based formula for babies who cannot receive their mother’s breast milk. But, if a doctor determines it is not safe for a baby to have lactose, a doctor may also recommend a soy based formula for babies as well. Overall, the most important thing is that your baby gets the necessary vitamins and minerals to live a happy and healthy life. Plum Organics infant formula is an infant formula that is designed to give your children all their necessary vitamins and minerals in a healthy and nutritious formula derived from grass fed cows. Plum Organics infant formula has a rating of 3.6 stars on Amazon. 143 people have reviewed it. That is an okay rating for that many reviews. However, when it comes to your child’s health, you probably want the best. A lot of people have commented on how this product tastes a little metallic. That could be expected with the added iron. A lot of other reviews comment that Plum Organics infant formula made their child extremely constipated. Most formula may make your child constipated, but it seems like this was over the top. There are a lot of people who really like this product. Many babies react really well to this formula and don’t get constipated. There are reports that they spit up less and that they are more regular in their bowel movements. However, there are a lot of negative responses too. However, Plum Organics infant formula is extremely foamy and bubbly when it is mixed together. A foamy formula can be really hard to get a child to take, and it will often times lead to them spitting up. Plum Organics was founded in 2007 by a group of mothers who were looking to provide organic and healthy food for their children. They had a passion for eating healthy and wanted to pass that to their children, then the rest of the world. Their mission is to “get the very best food from the very first bite to all the little ones.”In 2013 Plum Organics was sold to Campbell Soup Company, which allowed them to sell way more product and expand their reach to many other children around the world. Plum Organics infant formula is made of great ingredients that will give your child all the nourishment that they need. It is also a milk based product that is easy on your child’s stomach. There are also great prebiotics to help facilitate helpful bacteria in your gut so that your child can digest food better. There is a soy ingredient in this formula that may not be great for your child’s health. It is unclear if soy is a beneficial or harmful ingredient. 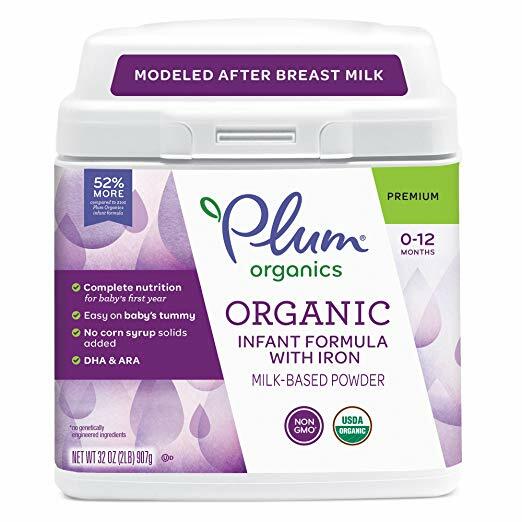 Also, the organic ingredients in Plum Organics infant formula have a lot of great benefits, but they also seem to cause more reactions than I have seen with other formulas. When you are preparing to buy an infant formula, it is important that you do your research. This article was a good look for you into Plum Organics infant formula. This is one of the more expensive formulas out there, but it is also one of the few choices for an organic formula for your child. Plum Organics infant formula uses ingredients designed to be natural and healthy for your child. Your child will have little to no risk of ingesting chemicals or GMOs when they drink Plum Organics infant formula. As with any formula you should monitor your child’s bowel movements and attitude when taking Plum Organics infant formula. If they are reacting to it poorly you should consider switching. If your child is not liking their current formula and you are thinking that organic is the way to go, consider switching to Plum Organics infant formula. WIth so many options of formula to choose from for your child, Plum Organics infant formula may be the right call for you if you are looking to go organic. However, the price tag may hold you back. If so, make sure to check out some of the other amazing options reviewed here at Green and Growing. If you have used this formula, feel free to drop us a comment and let other people know what you think! Here are some top questions that I found for people seriously considering buying the Plum Organics, Organic Infant Formula with Iron. chevron-circle-right Why is nonfat milk used when babies need fat? The fats in cow’s milk aren’t ideal for babies. Instead, formulas add the fats that will benefit babies the most. chevron-circle-right What is the shelf life of this product? Plum Organics infant formula should be consumed within 30 days of being opened.